What is it that makes Duro-Last so popular? Below are some key features and benefits of Duro-Last commercial roofing material. ● Impervious to Water. The Duro-Last roofing membrane is made of the same material that is used in pool liners. The primary reason it was first developed was to keep water from getting inside a building via the roof. ● The Membrane Lasts. Although it’s been known to last longer, Duro-Last roofing comes with a 15 or 20-year warranty. ● Flat and Sloped Roofs. Duro-Last membranes work best on flat or low-sloped roofs. ● Energy-Efficient. By adding a Duro-Last membrane to your roof, you will create an energy efficient environment that is protected from the sun. ● Heat and Fire Resistant. Duro-Last membranes resist fires, heat, and chemicals. They also hold up well against high winds. Duro-Last membranes are prefabricated in order to fit perfectly onto any residential or commercial roofing system. In most cases, 80% - 90% of the entire seam can be created in the factory and then delivered directly to the roof. The membranes design includes all accessories and attachments. By implementing one giant layer, contractors can ensure that the possibility of leaks is eliminated. In 2016, Duro-Last was awarded platinum certification by the American National Standards for Sustainable Roofing Membranes (NSF/ANSI) council. According to the NSF/ANSI, the Duro-Last membrane is verified as sustainable, durable, and high performing. The product either meets or exceeds all industry standards and sets the bar high for all roofing manufacturers. Duro-Last roofing systems have received numerous awards and certifications through the years due to its rugged construction and long-lasting material. Do you have any further questions about Duro-Last commercial roofing systems? Let the roofing specialists at A Plus Roofing answer you questions and help you with your next roofing installation project. We offer complete implementation as well as maintenance and repairs for every roof we install. Call us today at 952-894-5423. You can also message us on our contact page. We can inspect your roof and give you a free estimate! 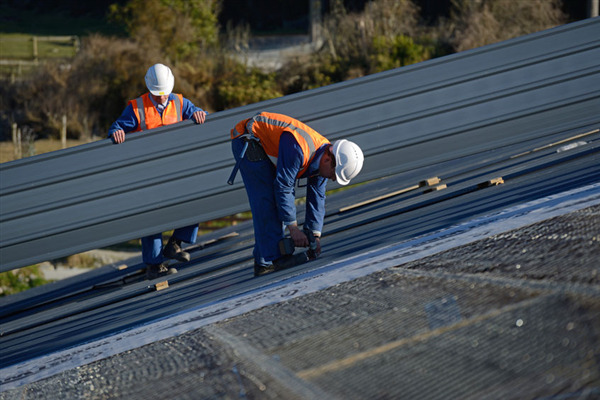 « Does a Commercial Flat Roof Ever Need Replacement?